Miss Jane by Brad Watson is a quiet book about a girl who raised in rural Mississippi in the beginning of the 20th century. Jane, the youngest of four kids, is born to older parents who are already in the midst of a growing frostiness and distance. What makes Jane’s birth noteworthy is that she is born with a genetic defect that causes her reproductive organs to be malformed. As a result of her condition, she suffers from incontinence, which will plague her throughout her whole life. Jane’s condition would be treatable through surgery today, but back then, it meant a solitary and nonsexual life for those who were born with it. Miss Jane is based on the real life of Watson’s great-aunt, and he has done an impressive job of imagining what her life was like, both emotionally and physically. As a young child, she learns quickly that she is different from other girls. She is unable to attend school, but she’s inquisitive and smart, and learns instead from her parents’ farm and observing the nature around her. By the end of the book, Jane is an old woman whose life, while lonely and at times tragic, has elements of connection and fulfillment. 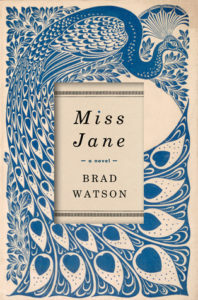 Watson is a sensuous writer, and Miss Jane is full of detail about the animals and nature found around Jane’s home. There is a lot of sexual imagery, in stark contrast to the chaste life Jane is forced to lead. Her closest confidante, the doctor who delivered her and who took a lifelong interest in her and her condition, was ironically infertile himself, making the two characters given the most attention and detail both unable to partake in the cycle of life Watson describes with such care. Miss Jane is not intensely sad, but neither is it hopeful or upbeat. Jane accepts her lot in life and learns to find joy despite it, but at her core she’s a lonely person in a family of very unhappy people. I respect Watson’s ability to tell this story without pitying his protagonist, or encouraging his reader to do so – he walked a fine line and he did it well. I recommend Miss Jane for people who don’t need a happy ending to enjoy a book.